Is furniture on the wall described as a console table or shelf? - Exactly what I need but only finding legged consoles. I would try looking for "floating cabinets", "floating drawers", or "wall-mounted cabinets". Is that travertine on the left wall? From this angle, it does look like it could be travertine, but it's actually tamo wood, which is known for its interesting, figured appearance. 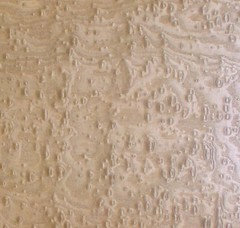 This image shows what our panels look like up close. Love the chandelier? What is the brend? Thank you. The lighting fixtures are silk "Scheherazade" lamps by Fortuny for Venetia Studium. Hello, simply beautiful! Would you please tell me where the lights are - I love this entry. who is the artist that did the floor installment? - The art statue is a perfect piece of my apartment. I’d like to know who created it. Wood flooring - Can you please tell me the details of the tripe of wood flooring used? Decor on shelf doesn't break up floor space.